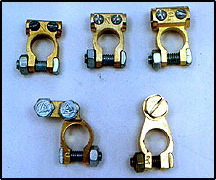 Brass Battery Terminals Copper Battery terminals Battery Connectors are available in many different designs but in general there are only main three types which are - LUCAS , ANGLE & STRIP. In which Lucas is available in three sizes, 9.5mm,11mm & 13mm. Top three figures are of Lucas type. We have also developed some special designs made by "FORGING" on the demand of our customer. We are capable of designing any type of Terminals through Forging or any other process, though it is too difficult.